As a homeowner, one goes through various of activities to keep up house maintence. For example, getting the grass cut, fixing those old tiles in the bathrooms or even getting rid of furniture. Regardless of the activities, there is one question you must ask yourself before even beginning a project, where will all this unwanted junk go? Unfortunately, one can only get away with so much trash and junk inside of those tiny dumpsters you get at home. Yet this is the exact reason why Bin There Dump That exist! Readily available dumpster inventory; you'll receive a dumpster in 24 hours, many times with same-day delivery! If you are looking for somewhere to place those old mattresses and bed frames, we'll be glad to take it. If you looking for a place to throw those shingles from a roofing job, we would be glad to take that too! 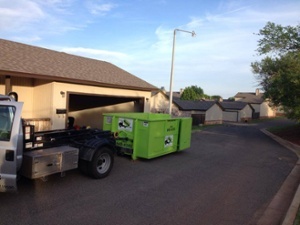 The best part of it all is that once the job is done, it is done for good and with our dumpsters, which include post job clean ups, rear-door access and pavement protection, you won't have to worry about anymore messes... for a while!